SHOP NOW at the online shop. full. Easier than refilling buckets! for condensation, drips and leaks. Booms for larger spaces, driveways, patios. 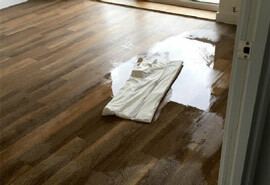 Flooding or leaking problems. Are you ready for any emergency? the UK does not include businesses. business much better than sandbags. - We offer the largest range of sizes. Contact us to discuss NOW. whom we offer generous discounts. or cost effectiveness as Absorbeez. efficiency, save you time and money. - Easy to store, transport and dispose of. European distance-selling dispute resolution platform. Pipes can burst unexpectedly, releasing up to two full baths of water an hour, bringing ceilings down and causing a major house flood. 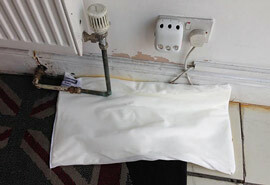 Shut off your water at the stopcock and place Absorbeez absorbent pads near the source of the burst pipe or at internal doors to help create a flood door to contain the leak. Condensation causes mould growth which can lead to health complications. 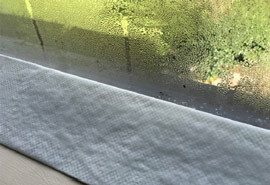 Use Absorbeez Strips to absorb 2L/3.5Pt of condensation run-off from windows, in the kitchen or in the bathroom. Drips in the bathroom from kitchen appliances and plumbing can damage fixtures and flooring, and make the floor slippery. 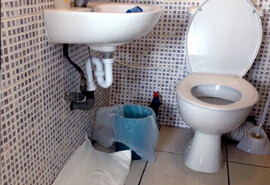 Absorbeez are a really easy solution compared to constantly replacing buckets underneath leaking taps. An Absorbeez Ab300 absorbs 8L/17Pts and a Dripeez takes 1.5L/3.1Pts of leaking water. Just leave them in place under the drip over time and replace when full. They are much slimmer than buckets and can protect you from the damage from drips in hard-to-reach places. Tired of putting newspapers and towels down when you defrost your fridge and freezer? Some fridges and freezers don't need to be defrosted but when you are cleaning the fridge, ice can and should be allowed to melt in order to clean properly. 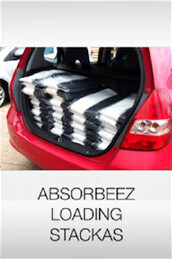 Absorbeez Strips are the easy and effective solution. They absorb 2L/4.2Pts of water and do not leave odours. Pipes and appliances can leak without warning. If your dishwasher, washing machine or boiler leaks, or if you've got a basement flooding, it could cost thousands to replace your wood floor or carpet, as well as the cost of fixing the source of the leak. Use Absorbeez to contain the leak and minimise damage. Just place a pad under the source and that will give you time to arrange the repair. Use Absorbeez absorbent pads to mop up any standing water. Our Ab300s take 8L/17Pt of water, and our Ab600s take 16L/33.8Pt of water. Keep them on your shelf until you need them. It's better to have them and not need them than need them and not have them. If you've got a leaking roof, a window that doesn't shut, a garage door with a bit of space under it, or if you're building an extension, rain will find its way into your home and can damage your floors and possessions. 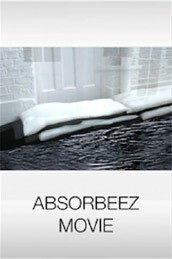 Absorbeez are the widest range of absorbent flood-defence products. Whatever way rain comes into your home, be it a ceiling leak, flooded basement or roof leak, there is a size in our range to absorb it at source. 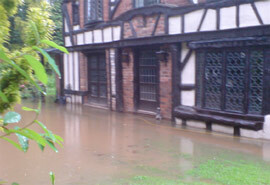 Even if you don't live in a 'flood risk' area, mains can burst suddenly in your street, particularly during winter. Have some Absorbeez pads ready on your shelf so that you can lay them in front of your doors and prevent ingress while the authorities repair the fault. Keeping a set of heavy filled sandbags for flooding which comes suddenly is not practical, but you can certainly keep some Absorbeez absorbent pads on your shelf. 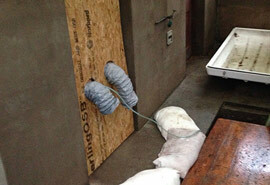 Absorbeez Ab1000 and Ab1200 are sandless sandbags that are designed to fit a single door snugly, without leaving gaps. 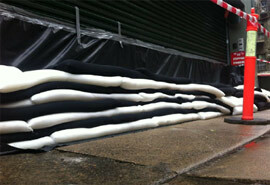 Where you might need six or eight traditional sand bags for flood protection, you'll need one or two Absorbeez. They are also much lighter and easier to store and dispose of at home. A pack of Ab1000s weighs just 2.5kg/5.5lb. 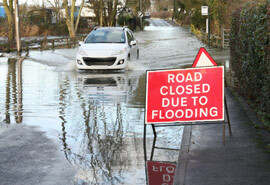 If you live near a river, have a plan to stop flooding if the water level rises. As well as the floodwater, a river flood can bring dangerous contaminants into your home and you may not be able to buy sandbags at times of peak demand. Absorbeez unique rip, drip and burst-resistant woven covering gives them unrivaled strength as a flood defence to help stop flooding entering your house. Keep some Absorbeez alternative sandbags in a drawer for flood prevention. Get in touch to find out which pad from our large range is right for you. Drains can overflow after heavy rains, causing floodwater to quickly back up and enter your home. Absorbeez sandless sandbags for flooding come in the largest range of sizes to cost-effectively protect all your doors from flooding. 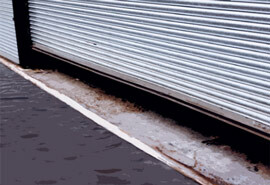 The Absorbeez Ab1800 is a sandless alternative to sandbags which is designed to fit a double door snugly, creating a flood barrier without gaps. One or two Ab1800s do the job of ten to twelve traditional sandbags without leaving gaps between the door's width through which water can run. Absorbeez Booms are 7.25m long and can be laid across the front of a garage door to prevent ingress of floodwater, without leaving gaps through which the water could still enter the garage. One Boom weighs just 1.9kg/4.1lb and can do the job of around 15 heavy sandbags. An alternative solution for a single garage is to use a wall of 1.8m Ab1800 alternative sand bags laid next to each other. 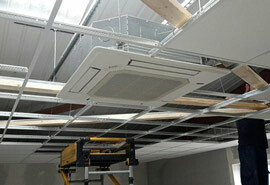 Air conditioning systems can begin to drip and leak over time. Rather than catching the leaks with buckets, which customers and staff can knock over causing another flood, place an Absorbeez pad underneath and simply replace when full. Our Ab600s have a 16L/33.8Pt capacity and can be kept in place under the dripping part for long periods. Fire sprinklers can typically release 90L/160Pt of water per minute causing major flood damage as well as fire damage. Although you need to get out of the building when the alarm goes off, when it is safe to return, use Absorbeez to contain the water. Our Ab1800s can absorb 30L/63.5Pt of water. 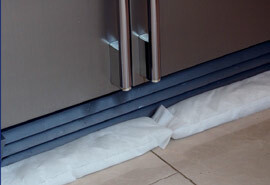 Lay our larger pads across doorways to prevent water moving between rooms into unaffected areas. Then use smaller pads like the Ab600 to soak up residual water from sprinklers and speed up the restoration process. It is important to keep the office clean, especially if clients are passing through. Absorbeez are a vital part of any janitorial kit for planned work and emergencies, and to help remove standing water and minimise the associated health and safety risks. Drinks dispensers can leak and drip, and water can accrue due to overfilling, causing dangerous accidental spillage on floors. Use a Dripeez to absorb water at source and avoid the slip hazard. 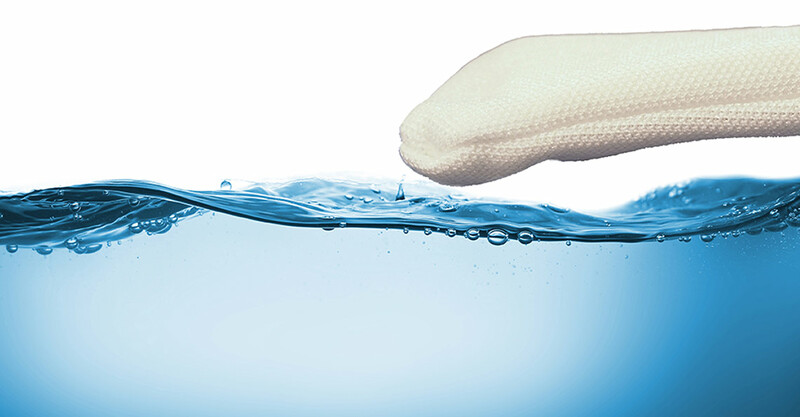 Alternatively an Ab100 Lite can act as a super-absorbent sponge which will retain what it absorbs. It will look better for your clients too. 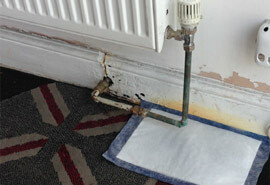 Leaking valves and corrosion can cause a lot of water to leak from your radiator. If you spot drips, get some Absorbeez down and call a plumber. Our Dripeez were specially designed for absorbing drips at source. They absorb 1.5L/3.1Pt. Our Ab300s absorb 8 litres and are a heavy-duty solution to absorb water from leaking radiators. There are so many sources of spills in your business. From knocking over a glass or tripping with a tray of drinks in your hand, to kicking that bucket of water you're using to wash the windows. Make sure you have some Absorbeez absorbent pads in your spill kit handy to absorb the spillage before a client or a coworker slips. Burst Pipes can release huge amounts of water, causing structural damage and destroying important documents and electrical equipment across multiple floors of the building. Beware, it is not just in winter that pipes burst. 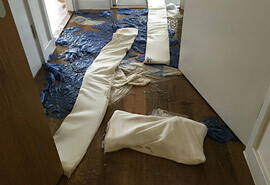 Old plumbing and accidental damage during maintenance work can also cause pipes to burst. Keep a few packs of Absorbeez in your janitorial closet or insist your facilities manager stocks them. Our Ab1800s can take 30L/63.5Pt of water and can seriously mitigate damage and downtime. There are many sources of escapes of water at work. Burst pipes, a leaking toilet, leaking taps, and floods from dishwashers and industrial equipment that uses water are just a few examples. Absorbeez are small and light. 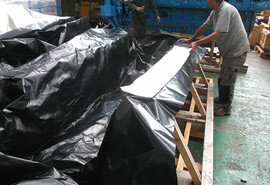 You can deploy them quickly to absorb up to 30L/63.5Pt of water and contain the leak, preventing damage and downtime. Drips in the bathroom or kitchen can cause slip hazards and dampness, which can facilitate hazardous mould growth, potentially leading to time off of work for important team members. 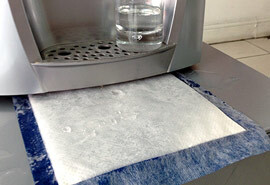 Absorbeez are a low-maintenance solution to drips. Just place a Dripeez or an Ab300 under the drip and leave it there in situ until it is full. It is easier than replacing buckets or mopping up drips. 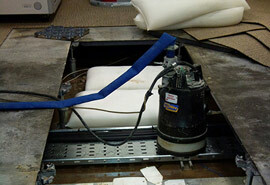 Flooding can halt production and damage expensive equipment. Especially if your factory makes a sterile product, it is important to avoid the hygiene implications of a flood as well as the downtime. Absorbeez alternative sandbags are engineered with double stitching and a heavy-duty covering to provide the most effective flood barrier. Keep them on your shelf and don't worry about where to get empty sandbags in a hurry when it is raining. Planning and flood prevention is better than cure. Never store inventory on the floor! 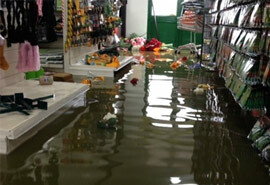 Even if you don't live in an area which is prone to flooding, burst mains and overflowing drains can destroy inventory that you spend thousands on and expose your store to high costs in restoration. It is hard and messy to store hessian sandbags but you can keep Absorbeez water barriers with your janitorial supplies to place at the door if flooding threatens your shop. With large doors and many pallets and boxes on the floor, warehouses are very exposed to flooding from storms, overflowing rivers, drains and gullies. Absorbeez Booms are 7.25m/23.8ft long and Ab1800s are 1.8m/5.9ft long. 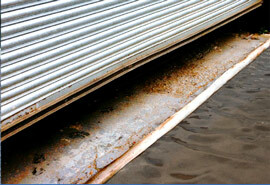 Create flood barriers that cover the width of warehouse doors and loading bays quickly. Keep our flood protection pads on the shelf until needed. It's a lot easier and quicker than storing hundreds of hessian sandbags. 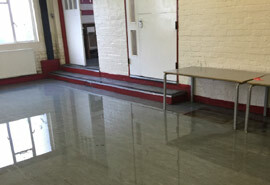 Flooding can make an office grind to a halt, damage electrical equipment and lead to months of disruption and lost income, as well as increased insurance premiums. Whether it be river flooding, storms, overflowing drains or burst mains, deploy Absorbeez to prevent ingress of floodwater into your office. Keep them on your janitorial supplies shelf and you can use them for overflowing toilets, burst pipes and spills inside the office too. Do you transport liquids as part of your business? If so, use Absorbeez to contain damage from leaks and reduce the risk of a slip hazard when loading and unloading. Our Ab600s absorb 16L/28.2Pt but come in a small, light pack before use. Whether you're building a new building to a tight deadline, or extending or renovating an existing building, rainwater ingress can hold up works and increase costs. 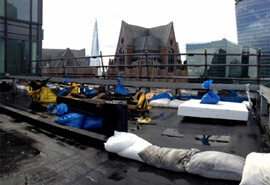 In the picture, they are using Absorbeez super-absorbent bags to prevent ingress of rainwater whilst doing roofing work. 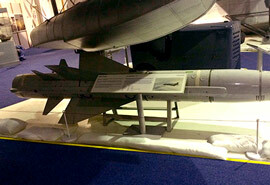 Your exhibits are highly valuable and unique. They require a lot of care in their upkeep and are expensive to restore if damaged. Our large range means there is a solution for you. 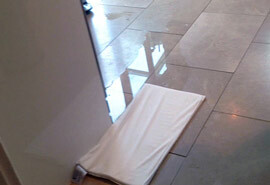 If your museum is flooded, lay Absorbeez absorbent booms around your exhibits to help prevent damage. Our unique 7.25m/23.8ft Booms absorb 29L/51pt and can keep your valuable exhibits dry and undamaged. Commercial refrigeration systems, freezers and chiller cabinets can all create dew-point condensation when they defrost, creating a slip hazard for customers. Our Strips were specially designed to absorb 2L/3.5Pt and can be left in place until they are full. 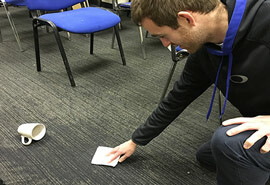 Absorbeez absorbent pads have many uses for university facilities managers, such as containing leaks from overflowing toilets, pipes and plumbing and absorbing spills. They can also be used as a moisture absorber in science labs. Condensation from liquid nitrogen vats, drips and spills from water purification systems and liquids in wet laboratories can all create hazards. Absorbeez quickly absorbs excess water. 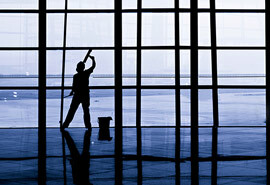 Whether you are fixing pipes or radiators, unblocking toilets or carrying out maintenance work, Absorbeez can help you. Our Dripeez absorb 1.5L/2.6Pt and are a cheap solution which will make your work much easier. Whatever it is you're transporting, if it can leak, Absorbeez super- absorbent pads can help. From wild animals moving to new zoos to marine engines, Absorbeez have provided solutions, and with capabilities to make custom products, we can provide a solution for you. 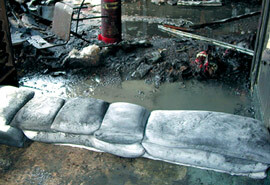 Absorbeez were first designed for the flood-restoration sector by flood-restoration specialists Action Dry and have been used in the sector since 1996. You can use them to extract moisture from carpets and absorb standing water, including from hard-to-reach places. Absorbeez absorb up to 30L/52.8Pt and come in small, light packs. If you want to save time, cost and embarrassment at your restaurant, use Absorbeez. 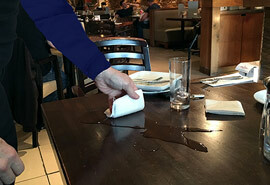 From using our Strips in fridge defrosting, to containing floods in the bathroom quickly, to providing waiters with an Ab100 Lite to absorb tabletop spills quickly, Absorbeez can prevent downtime and improve your service. 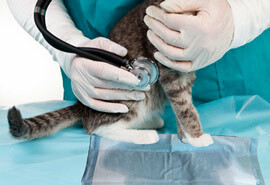 Many animals don't like going to the vet and find it a frightening experience. Absorbeez Dripeez and Ab300s can absorb urine at source and provide an absorbent solution for transporting animals. 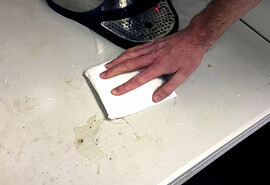 Absorbeez have been used for years in commercial cleaning. From daily janitorial work to specialist deep cleaning, Absorbeez can absorb excess water quickly. 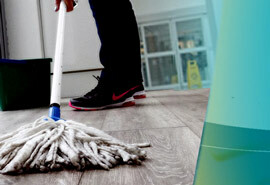 Especially if you clean whilst staff and customers walk around the premises, reduce the risk of slips by using Absorbeez. Our Ab300s can absorb 8L/14Pt of water and measure a manageable 300mm x 300mm/12in x 12in. 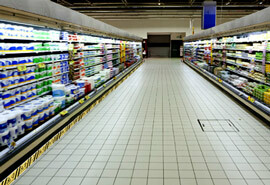 Condensation and defrosting can release a lot of water in your cold storage warehouse. Absorbeez are the absorbent pads with the widest range of sizes. Some pads take 1.5L/2.6Pt, others take 30L/52.8Pt. Prisoners flooding their cells is nothing new. Lay an Absorbeez Ab1000 single-door sized sandless sandbag across the cell door to act as a flood proof door to help prevent water leaving the cell and flooding the corridors. 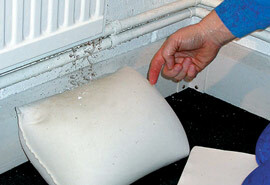 Once the leak is contained, use the same Ab1000 pad to absorb the excess water. It has a 17L/29.9Pt capacity. Want to release water to simulate a fire sprinkler, flood or rain on set without flooding the rest of the studio? You can arrange Absorbeez to form a barrier to contain the water. 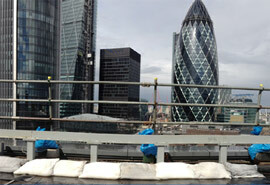 Our Booms are 7.25m long and are perfect for forming a quick, easy, disposable flood barrier. Absorbeez are used in packaging. If you are sending a liquid in the post or via a courier, Absorbeez absorbent pads can catch spills and leaks at source. Our Dripeez pads are just milimetres thick, have an impermeable side, and the water-absorbing polymer can absorb 1.5L/2.6Pt. Just lay them in your package! We can even make water-absorbing material and products to different sizes. 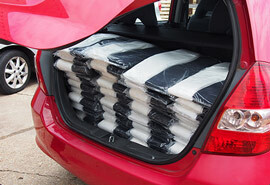 Absorbeez Dripeez are an easy solution for undertakers. They take up to 1.5L/2.6Pt and can be used for general spills or for placing under the deceased to absorb fluid leakage from orifices. Since 1996, Absorbeez have been making custom products on demand. 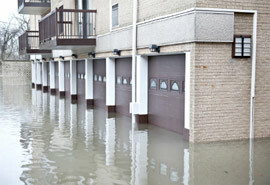 We make flood-protection products to fit doors with unusual sizes, condensation pads to fit particular windows, and pads and absorbent material as components for particular products. If you need an absorbent component for your product or a particular size or absorbency specification for use at your premises, send us a message. A traditional sandbag can weigh over 20kg/45lb and are bulky flood defences. A large van may be able to carry around 70 sand bags before passing its payload limits, and even then the sandbags probably won't all fit and you'll have to make multiple tips to load and distribute sandbags locally. Remember, each door needs 4-8 sandbags. An Ab1000 single-door sized sandless sandbag weighs just 500g/1.1lb. You could fit 2,800 in the same van and each door needs 1-2 sandless sandbags. No filling or pre-soaking necessary! 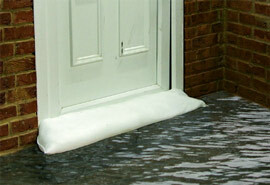 Absorbeez are easier, quicker, cheaper and offer better flood protection. Our UK-made range of sandbag alternatives have some enormous benefits for your flood defence plans. Our unique rip, drip and burst-resistant covering and double stitching gives maximum strength in extreme conditions and makes Absorbeez easy to handle before and after flooding without releasing all the water it has absorbed. Then they can be disposed of following normal local refuse guidelines. You're busy and you've got a lot of homes to get to before the flooding becomes more serious. We designed Absorbeez to make your emergency operations quicker and more efficient. Absorbeez Booms are 7.25m long. and rise to around 10cm They can be used to create a channel and hold back water to prevent roads becoming waterlogged. You would need at least 12 tube sandbags. Keep the town moving with Absorbeez! 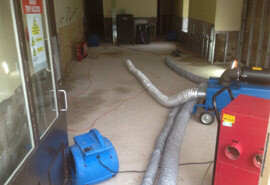 We can help you find the best flood-prevention solution to stop flooding next time. We also have 35 years of experience in flood-restoration and can give free advice on building drying using modern heat-drying technology. We can also advise on air-quality and surface-hygiene testing to prevent mould proliferation and consequent health complications. Even if you don't decide to transition your local flood-defence plan to completely replace sandbags with Absorbeez, Absorbeez sandbag alternatives can still help you. 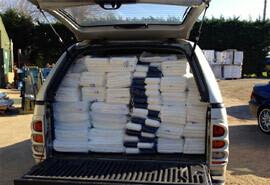 Absorbeez can be dispatched quickly and can provide a viable supplement when demand for sand bags is high. Get in touch, get a free sample, find out about our discounted price list and keep our details ready for when the water levels are next rising. A UK councillor shared with us that it costs a single sandbag costs a council around £13.00/ €16.00/ $18.30 across its life-cycle. The costs of storing, filling empty sandbags with sand, transporting heavy filled sandbags, collecting and sanitising the used bags all mount up. Can your local budget really sustain sandbags? To cover the width of a single door, one may need at least four sandbags. That is £52 per door. One Ab1000 does the job of those four sandbags. Apart from providing much better protection, each pad costs just £10.29 (ex VAT). Even adding on costs of delivery, when you consider how much easier it is to deploy and store Absorbeez, you're looking at huge budget savings. 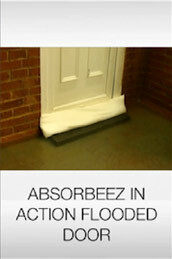 Protecting a door with Absorbeez sandless sandbags is up to five times cheaper than using traditional sandbags. 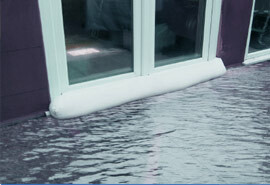 Absorbeez are light and small before use, but absorb floodwater and expand on contact forming a flood barrier. They are super strong and will create a flood door that will keep water out of properties much better than traditional hessian sandbags. Given budgetary constraints, can you afford disruption and closures in your local-authority offices, police station or fire station? Whether it be flooding from a roof leak, an overflowing toilet or a burst pipe, Absorbeez are small and easy to store and deploy, providing an easy flood control solution to help you stay open. Flooding can lead to weeks of downtime. Prevention is better than cure! When it comes to maintaining local-authority-owned social housing, Absorbeez are a must-have tool. They are small and light and don't take up much space in vans when driving between properties. You never know when you might need them! Use them for containing and mitigating plumbing and appliance leaks, accidental or malicious water damage and to absorb condensation and prevent dangerous mould growth.